Eating a Chocolate Orange will satisfy your sweet tooth. Using the latest Chocolate Orange discount codes is an amazing way to get great value for your money. 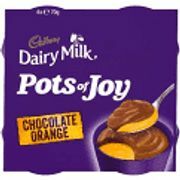 With great choices of Chocolate Orange products available, you are sure to find exactly what you are looking for. Get big discounts when you buy from Tesco, Superdrug, Wilko, and other UK sellers. Our savvy money-saving experts will provide you with useful tips for you to save money. Here at Latest Deals, we will provide you with information about the latest cheap Chocolate Orange deals and offers. Terry's Chocolate Orange Milk 157g - HALF PRICE! Terry's Chocolate Orange Milk Chocolate Box 157G - Half Price! Terry's Chocolate Orange Milk Chocolate. MY FAVOURITE! YUMMY! Find the latest chocolate orange sale and deals across the UK! It cannot be denied that chocolate oranges are becoming even more popular these days. Chocolate oranges lovers would agree that these two come well together. This is an interesting answer to your sweet tooth. Imagine the extract of real orange with smooth milk chocolate. You can divide them individually and eat them whenever you please. Just like how you would eat a real orange. It would not hurt to have it as a surprise treat once in a while. You can share it or eat it alone. It would not really matter. You would still enjoy it. At first taste, you will notice the chocolate. Then, the orange would kick in. Indeed, this is a luxury that you can surely afford. When it comes to Chocolate Orange product, Terry’s is probably one of the most famous. It was created in 1932 by Terry’s at the Chocolate Works, England. However, it was only from 2012-2017 when it became international. 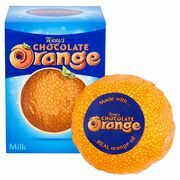 The Terry’s Chocolate Orange are made up of an orange-shaped ball of chocolates with orange oil. They are in 20 segments. Upon one look, they almost resemble a real orange. They are even wrapped in orange-skin foil. Thus, the unwrapping is indeed a delight. Traditionally, the ball was tapped on a hard surface so that the segments would separate from one another. Chocolate Orange Bar. This bar has six segments. It may remind you of Toblerone, only that it has smooth vertical segments. It is synonymous to a traditional orange shape. Chocolate Orange White Eggs. As the name suggests, this is the egg-shape version of the Chocolate Orange. However, you can only buy this on Easter. Chocolate Orange minis. These are good for bites because they are minis. Segsations Mini Eggs. Another product only available for Easter. But, the only difference is that these are foil-wrapped eggs are packaged individually. Segsations. If you want segments of chocolate, this is for you. It comes in many flavours. They are puffed rice, milk chocolate, cornflake, white chocolate, and all other layers. Chocolate Orange-Egg & Spoon. This is interesting because it comes with an orange fondant filling. Are you a fan of chocolate orange? If yes, you do not have to spend a fortune in buying yours. Look for chocolate orange deals and that should get you going. Here at Latest Deals, we will assist you in making your hunt for Terry's chocolate orange white easy. From Terrys chocolate orange to other variants including orange chocolate sticks, we’ve got you covered. This is made possible with our special offers, discount codes and sales available for Terrys chocolate orange cheesecake. Our team of money-saving experts and community of bargain hunters are always updated with budget-friendly deals and offers on chocolate orange biscuits. Find the right price that suits you and enjoy your shopping for a Terrys chocolate orange bar. Buy a Terrys chocolate orange easter egg now! Aside from a Terrys orange chocolate, there are other brands that you can go for. Make sure to use these discount codes upon checkout and enjoy fantastic money off. Keep in mind that our offers here are for a limited only, so once you spot a deal you like, grab it right away before it expires. Also, if you don’t want to miss out on every day low prices and special offers, bookmark this page now!